ARLINGTON, Texas – December 3, 2018 – Texas Trust Credit Union’s promotional home equity campaign received a silver Davey award from the Academy of Interactive and Visual Arts (AIVA). The four-color posters and billboards were created by Tractor Creative based in Lorena, Texas. 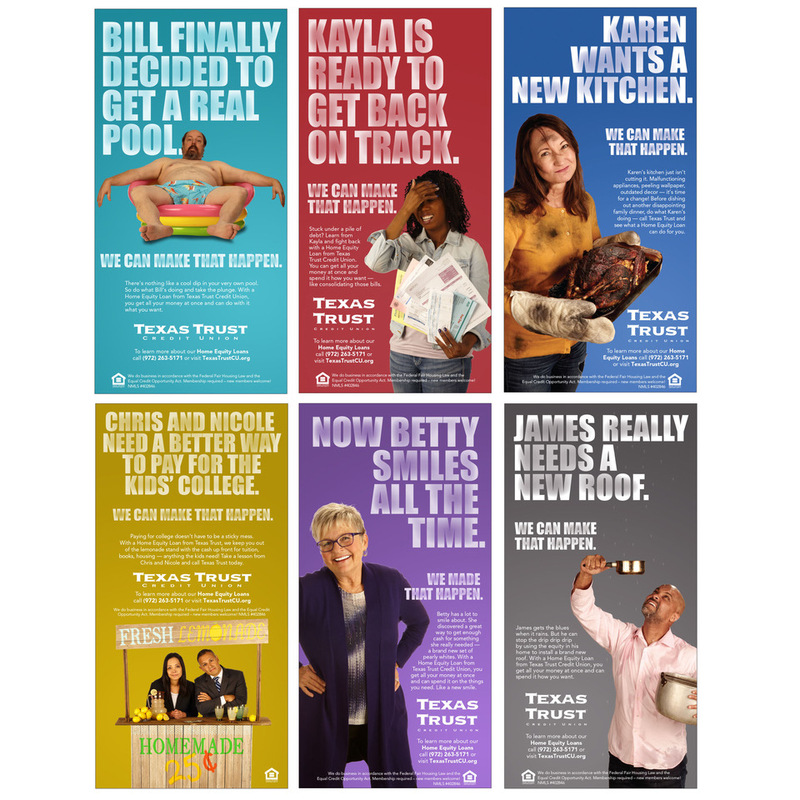 The collateral was recognized among 3,000 entries for its creative design and copywriting that cleverly conveys why consumers should turn to Texas Trust for a home equity loan. The collateral portrays six real-life scenarios showing how home equity loans can transform lives and help people reach their dreams. Ranging from renovating a home kitchen to dental implants to building a pool, paying for college, getting out of debt, or installing a new roof, the brochure was not only award-winning but effective, enabling Texas Trust to grow its home equity lending portfolio. The Davey award honors the finest creative work from the best small firms and agencies worldwide. Davey awards are judged by AIVA, an invitation-only member-based organization of leading professionals from various disciplines of the visual arts dedicated to embracing progress and the evolving nature of traditional and interactive media. Current AIVA membership includes: Code and Theory, Condé Nast, Disney, GE, Johns Hopkins Medicine, Microsoft, Tinder, MTV, Push, Publicis, Sesame Workshops, The Marketing Store, Worktank and Yahoo!, and many others. Texas Trust Credit Union was created in 1936 when a group of Chance Vought Aircraft Corporation employees pooled their savings so they could help each other achieve financial goals. Today, more than 115,000 members are served through checking and savings accounts; loans (personal, mortgage, auto, and small business); credit cards; insurance products; and investment services. Texas Trust Credit Union supports local students through its “Spirit Debit Rewards” program. With every eligible swipe of an SDR card, funds are donated to the school or district of the member’s choosing. To date, Texas Trust has donated more than $1.7 million since August 2011. Texas Trust serves members through 21 locations in Dallas, Denton, Tarrant, Henderson, Ellis, Johnson and Tom Green counties. With assets of more than $1.2 billion, Texas Trust is the 6th largest credit union in North Texas, the 17th largest in Texas, and was ranked the 10th best performing credit union in the country by Standard and Poor’s Global Market Intelligence. For more information, visit TexasTrustCU.org or follow us on facebook.com/texastrustcu or Twitter at @texastrustcu.